As For Football’s College Football Show with your host Rob Wright. 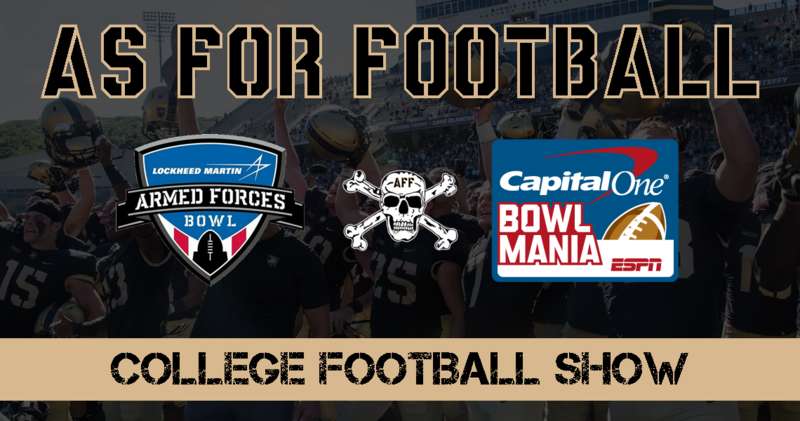 In this episode we recap the epic beatdown that Army handed to Houston in Armed Forces Bowl. Rob, Dan, and John give their reactions to the game (2:03), cover the records set by the Army Team (5:21), discuss what contributed to the unbelievable win (10:10), debate the best individual performances (17:10), whether this is the greatest Army Team of All Time (26:23), are Bowl Games Meaningless/should players sit out (35:13), pick games through December 29th (42:49), and John’s favorite thing of the week (58:55). Listened to your Houston Massacre podcast. Another great showing. Like to correct you guys on one thing about the 96 team. In my opinion, this 2018 is the greatest Army team in the modern era (i.e., since the 1958 Pete Dawkins’ undefeated team). They just nudge out the 96 team for winning the bowl game and turning it up to 11. They are the best. But Lee Corso may say, “Not so fast my friend”. The 96 team was riding the longest winning streak in Division 1 at the time with 11 straight wins carrying over two from 95. They were 9-0 after they demolished a very very good Air Force team at Michie. What blocked them from going 10-0 and a perfect regular season record was the monster known as Donovan McNabb. He was one of the most dynamic players in college football that year and showed why he would be a force in the NFL being nominated for 2019 NFL Hall of Fame. Both Army and Navy were ranked in the top 25 in the AN game and Army had the largest come from behind win. Ronnie McAda was the gunslinging triple option maestro at the controls and the best passing option QB up until Hopkins. Still have McAda by a nose in terms of overall skill as QB, but Hopkins may “pass” him next year. In the Independence Bowl, Army faced the SEC version of McNabb – NFL QB Dameyune Craig. Army was getting crushed 32-7 at the start of the 4th quarter and then McAda let loose with a passing and option onslaught utilizing the athleticism of slot back Bobby Williams. Sutton had excellent clock management, scored 22 unanswered and was driving at the end for the likely win. Auburn could not stop the drive. With less than a minute left, everyone expected a pass attempt to the end zone on third down and then one last attempt for the win. Instead, Sutton set up for a FG on third down. His kicker was a senior who had never missed inside the 40. Sutton had supreme confidence in J. Parker’s boot. The 96 season was the first year for overtime, so Sutton played for the tie to go to the extra period knowing that Auburn was smoked and would not be able to stop the option. Parker missed and the 2018 team has nudged ahead of the 96 team for the title. On the other side of the line, the 96 Army defense was big, fast and nasty. Man for man as good as 2018. Secondary today though is best I have ever seen. 2018 then 1996 then 2017 then 1988 (should have beat Alabama in Sun Bowl – lost by one with three FG blocks from legend Derrick Thomas) then 2016 for breaking the streak. Merry Christmas and BEAT NAVY!!! Love your show and articles. Very entertaining and you’re on point most of the time. I want to correct the record on the ‘96 team. Ronnie McAda was an excellent passer. He threw for 2,333 yards from ‘94-‘96. He threw for 954 yards in ‘96 with a 62.3% completion percentage, including the famous 4th and 24 play to save the game against Navy. Independence Bowl – I was there – was a tale of two halves. Auburn couldn’t stop Army’s running or passing attacks in the 2nd half to save their lives. We had a 3rd and goal around Auburn’s 5 yard line, down by 3, with about 30 seconds left. Sutton decided to kick on 3rd down…we missed! Horrible decision. With the momentum we had, Army had a decent chance of scoring a TD and winning with another shot at the end zone. When you’re playing Auburn and clearly have the momentum, you at least try to go for the win before kicking. McAda was drafted last (Mr. Irrelevant) by Green Bay, NOT because of his triple option abilities. The ‘96 team was great largely BECAUSE McAda ran the option great AND threw well…and also had a defense that was very similar in toughness/tenacity to this year’s defense. That was a 10 win team – lost to Auburn on a bad coaching decision; one loss was to a really good Syracuse team with Donovan McNabb. Comparing this year’s team with the ‘96 team, I’d definitely say that this year’s team is better…I mean you have to because of the results against OU and UH. But again, not that far apart…’96 was potentially one bad coaching decision away from being the first 11 win team. The biggest difference is the sustained success over the last three years; that hasn’t been matched in a very long time. Thanks Mike. I couldn’t remember the details (obviously). Appreciate the correction.